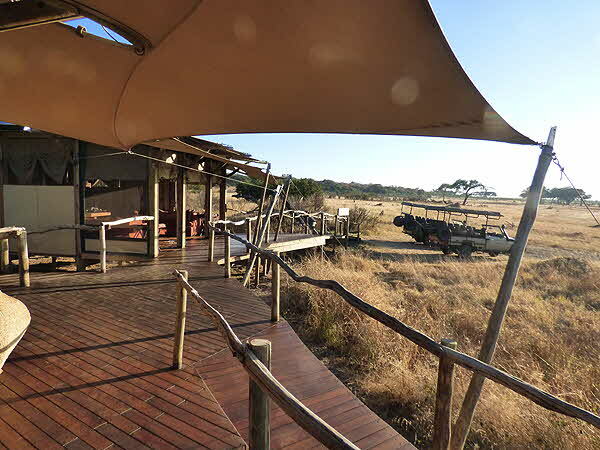 While visiting Zimbabwe we were lucky enough to be invited to spend one night at Somalisa Camp, located in the heart of the Hwange National Park that hosts over 100 mammal and 400 bird species. Somalisa is called a bush camp, but it was much nicer than a number of the hotels we stayed in during our trip. 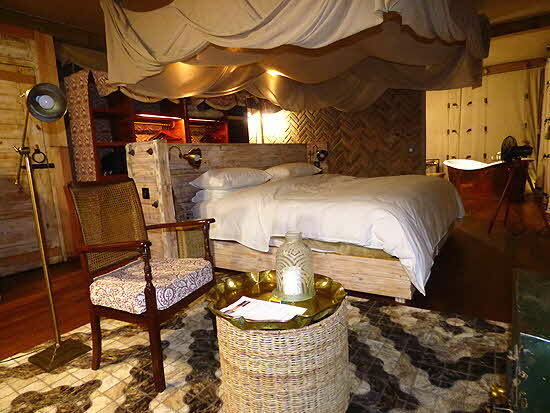 It was recently re-built, adding beautifully furnished luxury canvas tents each with en suite bathrooms that included flush toilets, double copper sinks, indoor and outdoor showers, as well as copper slipper-style bathtubs. There was a privacy cabinet so that food service could deliver meals from the outside, without disturbing the guests. The provided toiletries were natural products of the highest order in handsomely crafted containers. In the tent we spent the night, amongst the other high end furnishings there was a king size bed with Egyptian cotton linen and a well-stocked wood burning stove we made good use of, as it was near the end of autumn and the nights were bitterly cold. Built in shelves lined one wall and the opposite wall was a very large screened window which could be covered by canvas flaps to keep in the heat. The window looked out towards one of the watering holes; outside the screened window was a covered porch so that we could sit outside our room and watch the animal passing scene. 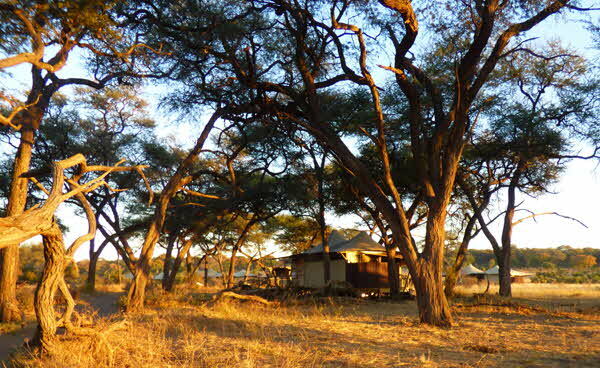 Nestled under a canopy of Acacia trees and overlooking two waterholes, Somalisa Camp and Somalisa Acacia, twin camps located in a private concession at the park, offer their guests ultimate luxury as well as the possibility of seeing herds of elephants as they came to drink at the waterholes as well as numerous other animals drawn to the available water. Possible activities for visitors are game drives through the private concession, safari walks, and game viewing from a blind near the water hole; that should keep you more than occupied during the day. 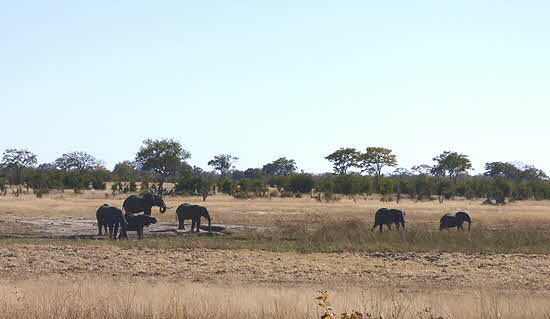 However if you choose to relax in camp, you can watch the game wandering through, to and from the waterhole. There is also the possibility of a night drive using the camp’s Rovers driven by the camps rangers, which is what we did, seeing elephants, lions and other animals on-the-hoof so to speak. The main building where the dining room is located includes split level decking with a separate lounge, as well as a small splash pool for guests. Dinner was served buffet-style while we sat by the bonfire and was fairly simple but tasty and satisfying. The Somalisa camps are located about half way by highway and then Road Ranger from Bulawayo, Zimbabwe’s second largest city, and Victoria Falls, the tourism center by the Zambezi River. One thing to note is that Somalisa keeps a highly carbon-neutral footprint by using large photovoltaic panels (solar cells) located over the camp’s auxiliary buildings, garage and offices; the panels charge batteries during the day that provide all the necessary electricity day and night. They are also making sure that the water holes are provided with the necessary water by using electric pumps that operate with electricity generated from smaller solar panels located over the pumps. Water, both black and brown, is cleaned and filtered at a sewerage plant near the camp and is clean enough to drink; that water is normally pumped to the animal ponds. The elephants stand and wait by the water pumps - they seem to know when the sun becomes powerful enough to get them working. 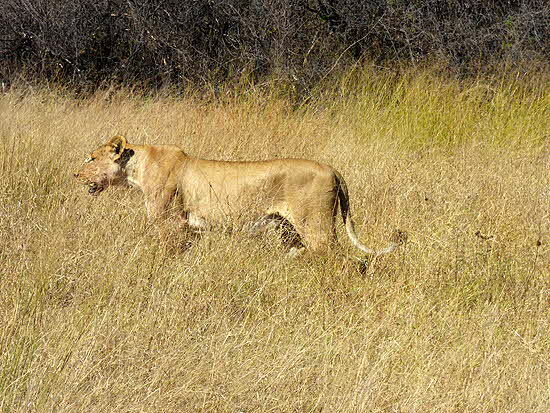 Somalisa is an open camp and the animals walk freely around the camp day or night, so you have to react quickly to things that you are not expecting. You are in the middle of the “bush” and, after sunset, there are lots of carnivorous animals; you will be escorted by gun toting rangers from dinner to your tent, and in every tent there is an alarm-raising horn to be used to call for assistance if an animal threatens your tent. When you visit any of the bush camps, make sure to bring a flashlight with you; you will need it at night even though the rangers carry flashlights in addition to their weapons.